Maturing fruits of shining oregon grape as seen on ice age flood sandbars between Five Mile and the Little Spokane River, Spokane County, WA.......June 29, 2019. 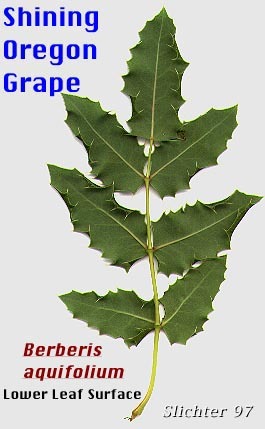 Photo at right of the pinnately compound leaf of shining oregon grape. Shining oregon grape is the state flower of Oregon. 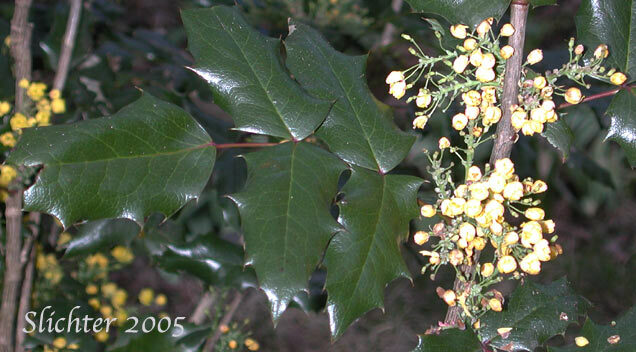 Due to its shiny holly-like leaves, bluish berries and yellow flowers, it is prized as an ornamental. It is a spreading to erect shrub from 15-300 cm tall. 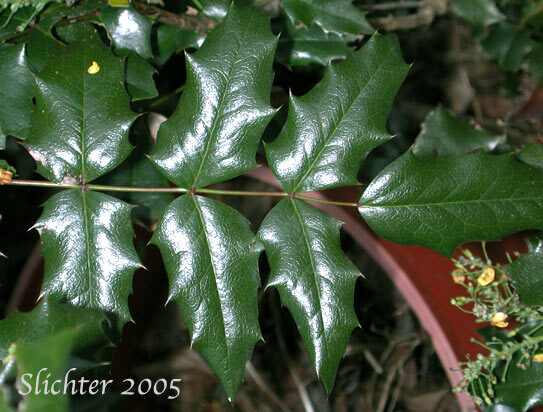 The pinnately compound leaves have 5-11 leaflets, shiny on both surfaces, and spinulose or spiny on the leaf margins. Approximately 8-10 spiny teeth are found on each side of a leaflet. The leaflets are about 3-8 cm long and about 2-5 cm wide, with an oblong to ovate or ovate-lanceolate shape. The several racemes are 3-8 cm long with the outer sepals or bracts somewhat greenish, from 2-3 mm long, and the inner sepals 6-8 mm long and bright yellow. The bilobed petals are oblong in shape and slightly shorter than the inner sepals. The berries are blue with a whitish bloom round-ellipsoid in shape, and from 7-14 mm long. 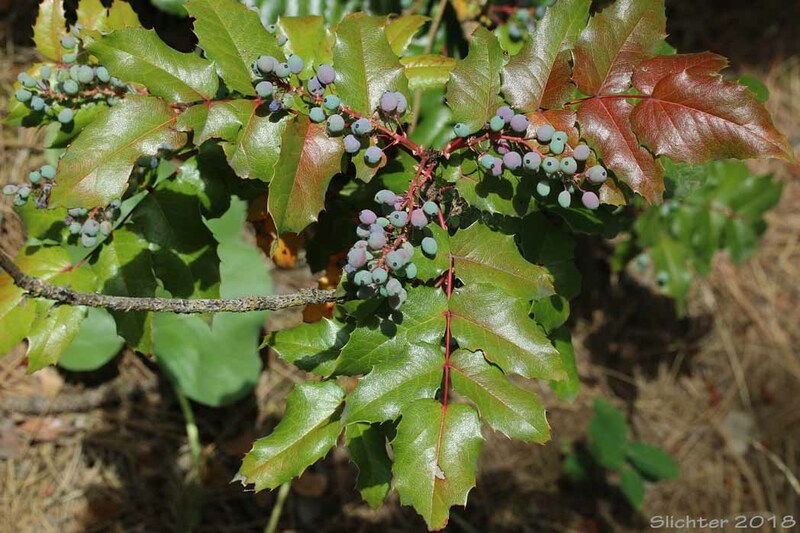 Shining Oregon grape may be found on rocky soils both in forests and among sagebrush. It especially favors open or exposed locations along roadways or rocky surfaces. 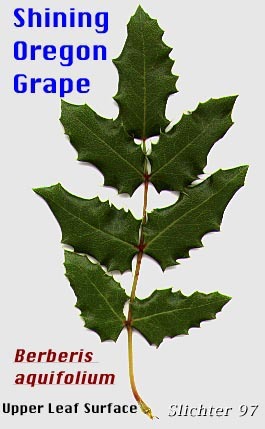 Shining Oregon grape is found from southern British Columbia south along the eastern base of the Cascades and to the coast to the southern Willamette Valley. It is found eastward across northern Washington to northeastern Idaho.